Meet the Taco Brothers, the beef thirsty taco pioneers of the great Taco Rebellion of 1881. Following the rebellion Old El Paso is not the same place it once was, the brothers need your help to accumulate some wealth to help them fund their taco empire. 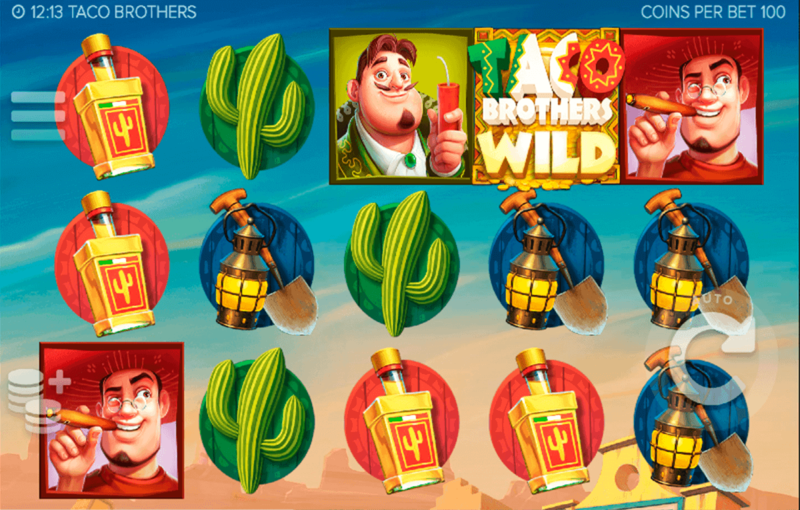 Spin the wheel on this Mexican themed 5 reel slot and uncover cactus and tequila symbols while playing your way through multi-level bonus rounds. Go ahead and play casino slots online now! Elk Studios are one of the newer entrants of the market, but they have quickly proven themselves amongst other companies that have been around for much longer. They bring very creative and innovative design choices into their high-quality products and always work with a high level of innovative technology. So, try to find UK slot games here. This exciting online slot has a very entertaining narrative which is easily understood through the great animations and high-quality art. You are transported into Mexico and Captain Diaz has come to the village of Santa Maria to steal every single taco in town. The brothers Paso, Pepe & Pico will step up and try to save the village and correct the situation. This is indeed why this is one of the online best slot games to play. There are plenty of symbols on the reels. You will find each of the three taco brothers along with a cactus, a guitar, some digging equipment and of course a bottle of tequila. There is also a wild symbol which is represented by a big bell. Through the 5 reels and 3 rows, you will clearly see Santa Maria, which will immerse you right into the setting and together with its Mexican soundtrack it enhances the game feel massive, offering you a gameplay experience you will not forget. The great polished comic art and the narrative are not everything that is great about this game - it includes 243 paylines that you can try to discover by betting a minimum of 10p or if you like up to a maximum of £50. To increase your chances of winning, even more, this game features very interesting bonus features. 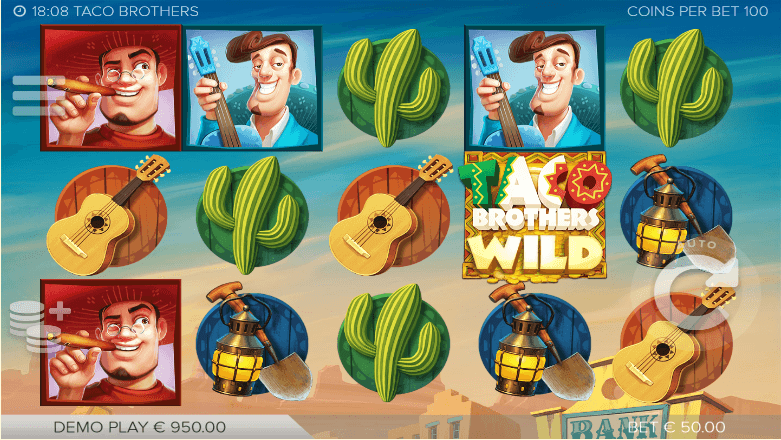 The Wild Escape Free spins feature is triggered by discovering three safe symbols on the reels one, three and five. You will be taken to a different reel set and on each spin one of the brothers will drop on reel five and transform into a running wild, this means that on each following spin they will “run” one position to the left as they try to escape on the opposite side of the reels. You will encounter two different characters on the new reel set: Captain Diaz and Senorita. If Captain Dias lands on one of the reels he will imprison one of the brothers on their position, keeping their movement locked. If he imprisons all three of them the feature ends and you will be taken back to the base game. Senorita tries to help the brothers, so whenever she will land on the reels she will release any of the locked brothers and push them back one or two positions. If they are on the same row she will push them all the way back to reel five. During this feature, all the wins are paid at a multiplier level that can reach up to 3x. This multiplier will be set at the start of the feature by an exploding safe. There is also another exciting bonus feature. The Taco Brothers Respin. If you land two of the taco brothers anywhere on the reels they will award you with a respin of all reels that don’t contain a safe or one of the Taco brothers themselves. This game is filled with excitement and personality. Through the nice animations, you will understand and emerge into the narrative very quickly. The art style looks extremely polished and of very high standard quality. It is very immersive and the interesting bonus features will make your spin very profitable. This online slot is a great variation from the traditional slot games and will ensure entertainment and fun. After enjoying this game to the max you might also want to try our lights slot.